Do you have trouble sleeping through the night? Do you wish you had more energy to keep up with your job, your family, your life? Would you like to cook more health-supportive meals, but just don’t have the time? I’ve been blending for health since 2004, when I made my first purchase of a high end blender. A year later, I was hosting green smoothie challenges, helping people just like you increase their leafy green and fruit intake with 32 ounces of delicious, blended, whole food goodness a day. Today, while I still enjoy green smoothies (and green smoothie bowls), I use my blender for so much more! If you’d like to learn how to make whole food meals in an hour or less a day, I invite you to join my Badass Blending recipe club! 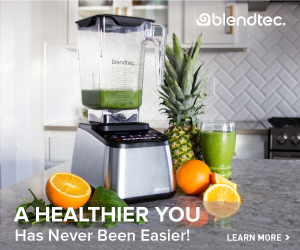 Head over to Blendtec.com to purchase a machine of your choice using this link (opens in new window). I’ll follow up with recipes and other resources to support you in making good food choices, no matter your dietary preference. Placed Your Order? Enter your details to get my 10-Day Kickstart. Disclosure: I have partnered with Blendtec and other brands and stand to receive a commission on any sales made through links that appear on this page and in the emails I send to you. The offer presented here is independent of Blendtec and does not imply any binding relationships, liability, or responsibility of Blendtec. While I stand behind the products and services I promote, please make sure to exercise your own personal discretion and wisdom before investing or making changes to your diet or lifestyle.